We are also pleased to offer gift certificates. Our products make perfect and very special gifts and are absolutely wonderful for baby showers. The printed certificates are great to have on hand, so that you will always be ready for your up coming events (showers, birthdays, and holidays). Free Shipping! Printed gift certificates are only $2 additional. We offer gift certificates in two forms. Choose either an electronic gift certificate or a beautifully printed gift certificate. 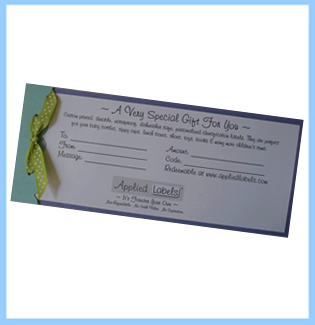 Both types of gift certificates include a description of the labels for the recipient. We offer the very best in personalized name labels. Our selection includes waterproof labels, dishwasher-safe labels, specialty baby bottle labels, date labels and clothing labels like iron-ons labels. They are the perfect labels for kids attending daycare, school, camp. They make the perfect thoughtful gift.